Please forgive me for starting this post with a national service message. The entire Northeast was recently ravaged by Hurricane Sandy. Many people who live in the area are still suffering from the aftermath, in need of shelter, clothing, and food. Please help by donating whatever you can at www.redcross.org. Every little bit helps! Now, here’s an easy autumn breakfast recipe highlighting seasonal apples – just right for all those extras you got at the you-pick. Baked with granola for crunch, and topped with flavored yogurt for protein, these little fruit make a warm, comforting, nutritious breakfast. 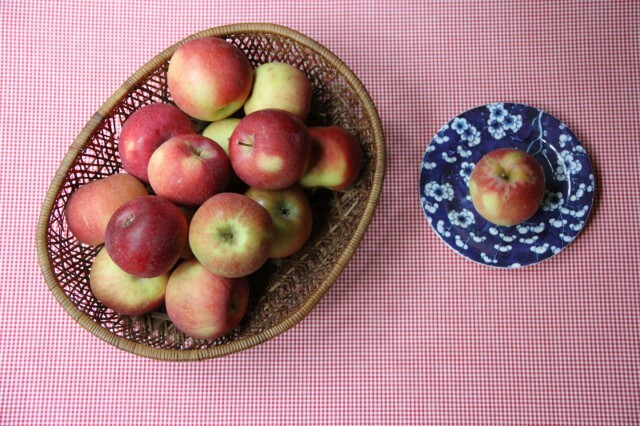 Use tart apples, like Granny Smith or McIntosh, for pie-like flavors. If you like, add some apple pie spices (cinnamon, ginger, nutmeg, mace or cardamom) for a deeper aromatic undertone. Changing the type of granola you use can greatly alter the flavor profile of your baked apples. Experiment with different nuts, coconut, or dried fruit varieties. Or, refer to a prior Breakfast in Bed post for Lusciously Light Granola. 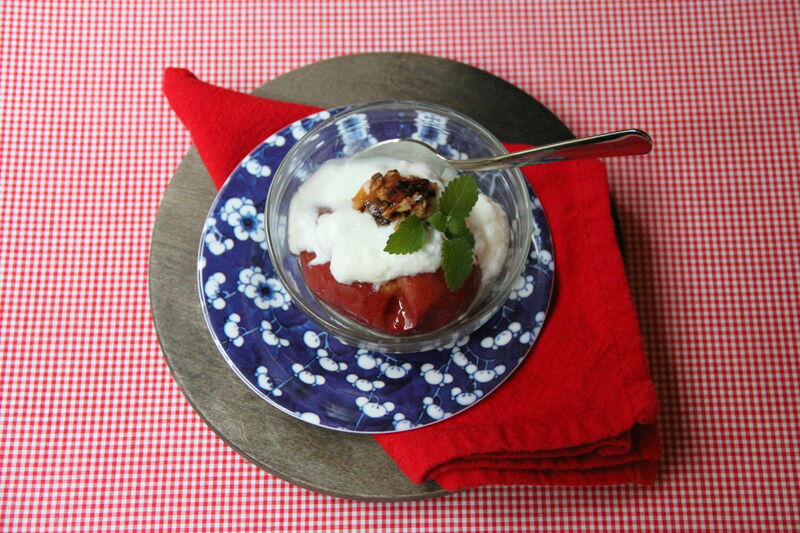 If you like, swap out the apple juice for brandy, and the yogurt for whipped cream, for an old-time, boozy dessert. Or, simply stick with the program for a warm, comforting breakfast in bed. Preheat oven to 325°. Core apples, leaving skin intact, and place in small baking dish. 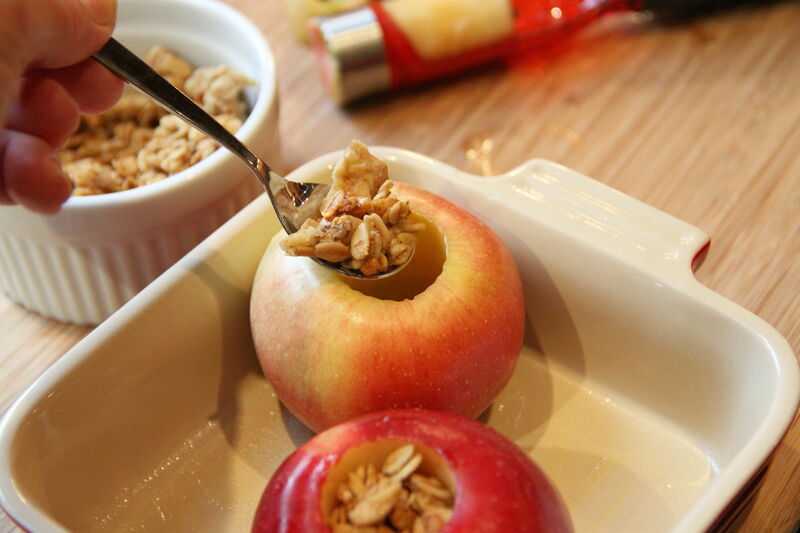 Fill cored center of apples with granola. Pour honey in bottom of baking dish and drizzle with honey. Bake 30 to 40 minutes until apples are cooked through and soft, and granola is lightly toasted. 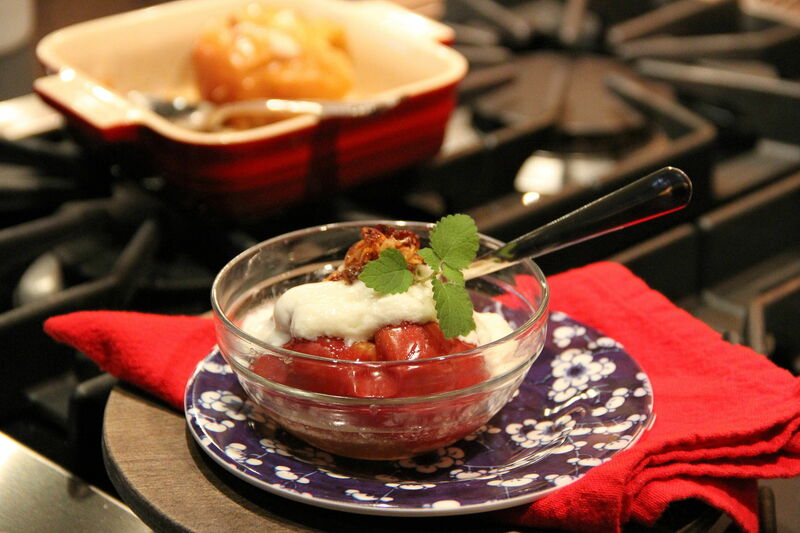 Spoon yogurt over apples, garnish with mint, and serve while still warm. Well, it’s finally here- Election Day. Regardless of whom you voted for, I think that there’s one thing that we can all agree on- we’ll be glad when the election is over. Until then, this special day has me feeling patriotic and what could be more patriotic than red, white and blue, stars and stripes, and the American flag! There’s nothing understated about the bold use of this oversized flag. What draws me to this room is that it is done so well. 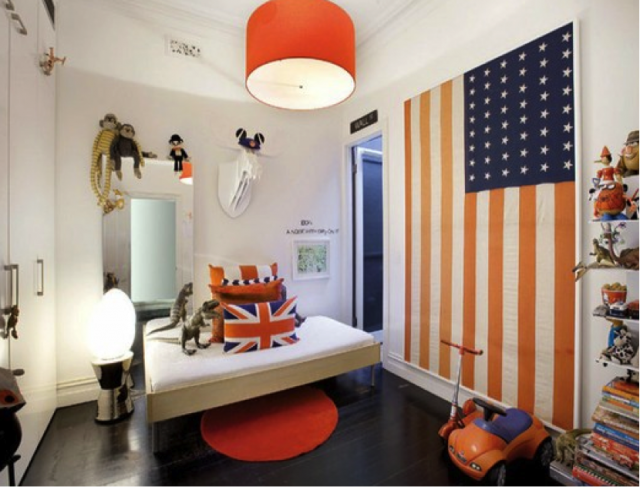 The flag is framed in white and provides the color theme for the rest of the space. It’s happy and exciting, which is just what a child’s room should be. The literal use of the flag at the top of the bed aside, I’m really drawn to this bedding. It’s a reversal of the stars and stripes theme. 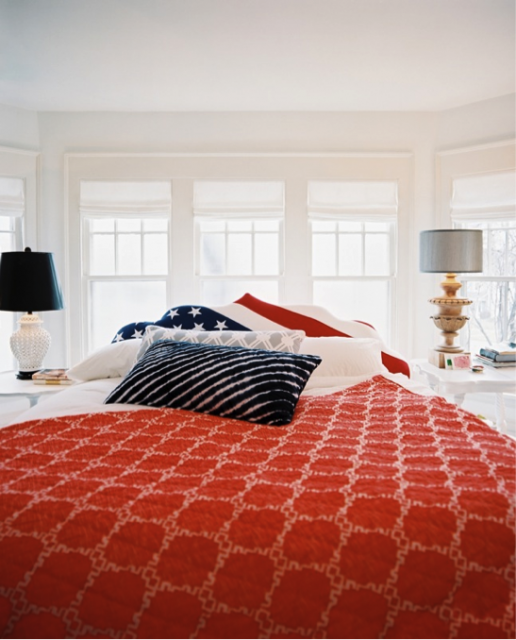 The quilt is a sophisticated use of red and white and it looks great with the striped pillow. It’s just enough of a nod to the flag without being overpowering. This simple room feels clean and classic. From the presumably vintage quilt on the bed to the light blue striped throw pillow to the boat painting, the room represents understated Americana at its best. 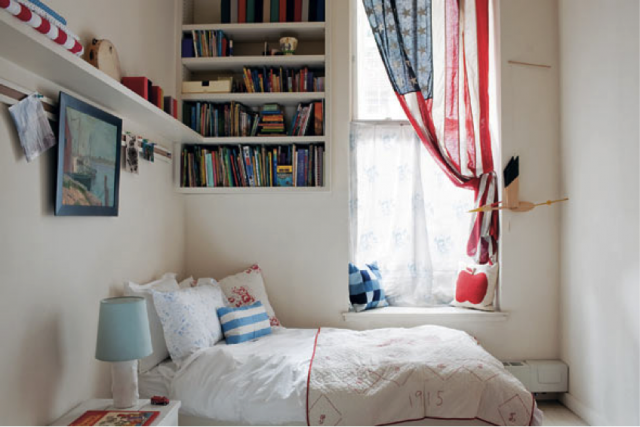 The flag-as-curtain ties the whole room together. It should be noted that there are official rules for using the flag indoors and technically, this room is breaking those rules. I would assert that decorating is all about breaking rules and that America was founded with independent sensibilities in mind. If using the flag in this manner isn’t for you, you have the freedom to go a different direction. Books! The New York Times wrote that doing this type of home styling might be over the top. However, I think that if you’ve got the downtime and creative drive to turn your books into a showpiece, go for it! 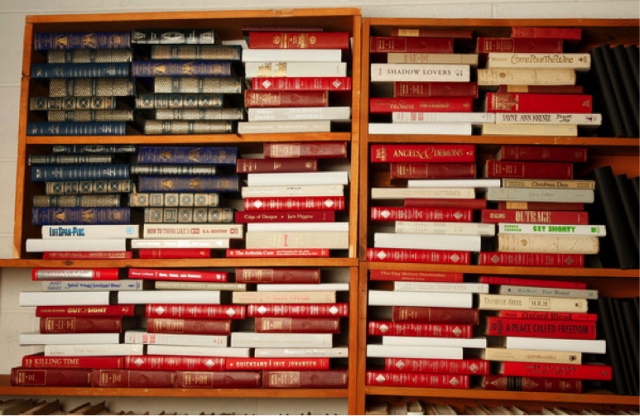 I hope that you’ve been inspired by Old Glory this week and I hope that you vote today. Regarding Hurricane Sandy, please know that all of us on the West Coast are thinking of all of you on the East Coast. Take care. 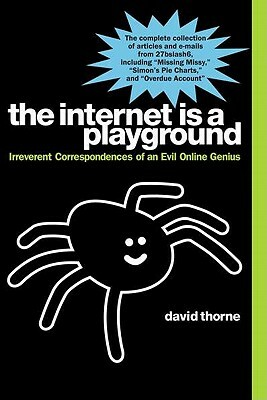 the internet is a playground: Irreverent Correspondences of an Evil Online Genius by David Thorne. 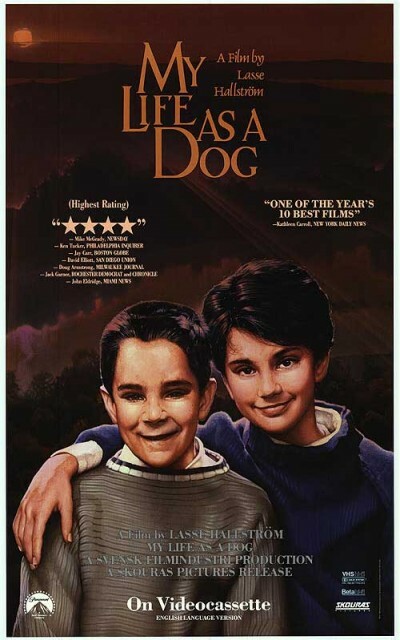 Attention: this bedtime story is approved for adults only! Read it aloud to your spouse or partner, or the pet you believe, to an unhealthy extent, is a suitable replacement for a spouse or partner. However you choose to go about it, by all means go about it. David Thorne’s book, previously published on his website 27b/6 is well worth reading if you are not easily offended and have a good sense of humor. The bulk of this book is email correspondences the author has engaged in, clearly for his own amusement. Generally the people he engages with have asked him for something or behaved in some manner which has pissed him off and he engages them in often lengthy logorrheic email exchanges. In the end, David either gets away with something by sheer tenacity, or manages to make the other party look like complete jerks which, oftentimes, they are. From wearing down a poor Blockbuster Video rep until she finds herself forgiving all his fines to letting bigots who write him to tell them how much they hate him show their true colors, his shameless and hilarious correspondences are funny and also (for my part at least) always seem to put people in their place. It’s a fun read when you don’t want to commit to a long story. I love it. If you don’t…contact the author. p.s. Extra points if you can figure out the origin of the name 27b/6! If you’re like me, you probably spend an inordinate amount of time in front of a computer screen. It’s an unfortunate consequence of living in a digital world, and our eyes bear the brunt of the pain. Think of your computer screen as a big light bulb that you stare at for hours on end. It’s not that much different than staring at a regular light bulb, except it’s not as bright and we’ve grown used to it — still bad for your eyes. The effects of working in front of a computer screen are magnified at night. Many people will lower the brightness of their screen to make it easier on their eyes after sundown, but a dimmer screen only solves part of the problem. In addition to adjusting the brightness of your screen, you should also adjust the color. Let me explain. Natural daylight registers at around 6,500K, while incandescent and fluorescent bulbs produce light somewhere between 2,700 and 3,300K. A main difference between color temperatures is that higher temperatures appear bluer, while lower temperatures appear more yellow or red. 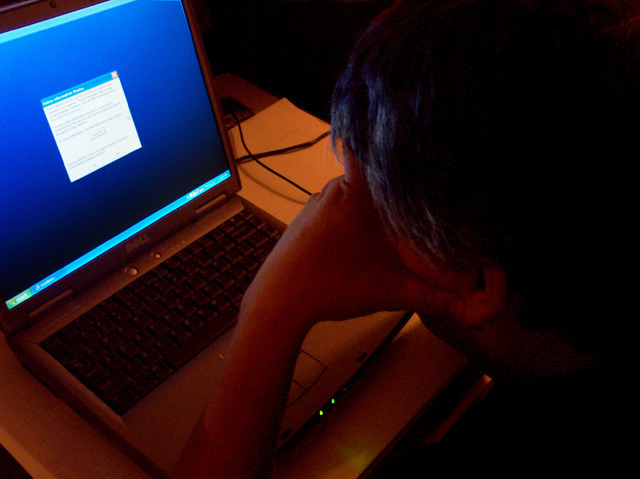 Computer screens are designed to work best with daylight, and produce a bluer light between 5,500 and 10,500K. 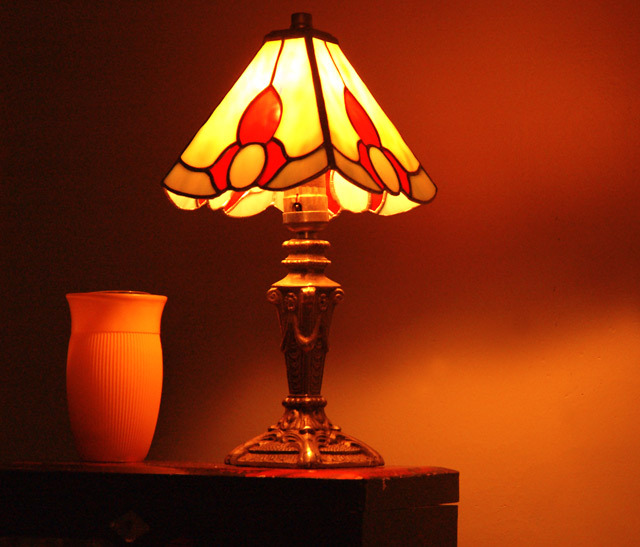 However, when you’re working under artificial light at night, the color light produced by your computer screen clashes with the ambient light in the room; it irritates our eyes and our brains. To help equalize the light temperatures, developers have created programs that gradually lower the temperature of your computer’s backlight according to the time of the day. During normal business hours you won’t notice much of a difference, but if you flip your laptop open at night you’ll notice a red hue to your screen. This change takes some time to get used it, but once you try it, you probably won’t want to switch back. I adjusted to it after only a couple of nights, and can’t stand to look at unadjusted screens anymore. In addition to reducing strain on your eyes, proponents of these programs also argue that adjusting your screen’s temperature at night helps you sleep better. First, your eyes will feel rested (I hate tired eyes). Second, your body is more used to lower temperature light at night, because our biological clocks (circadian rhythms) are quite sensitive to light. When it’s dark outside, your body produces melatonin, which helps you fall asleep. Staring at a bright computer screen disrupts this process, and can actually make you more alert. Try sitting under a full spectrum light at night, you’ll probably never fall asleep. While the best way to sleep better is to completely avoid the computer at night, we don’t always have this luxury. So, if you find yourself needing to burn some midnight oil, try lowering the temperature of your computer screen. Programs like f.lux are free, and available for Mac, Windows, and Linux operating systems. There are other programs available that do the same thing, but f.lux seems to be the most popular. It also adjusts your computer screen automatically based on your location, which is a nice touch. After a while, you probably won’t even notice the transition anymore. Have you tried it? Let us know what you think about the comments below.